Picturesque later 19th century, asymmetrical, 3-bay, single storey, L-plan former gamekeepers cottage with later alterations. Set on the SW bank of the Garbh Uisge River close to Kilmahog Bridge (see separate listing). The principal (SE) and side (NE) elevation are adorned with decorative bargeboards and diamond pane glazing. It retains its appealing original detailing, is of good local interest, and provides an attractive grouping with the bridge. Principal SE elevation: The basket arched entrance is set to a gabled porch to the centre, a prominent battered base course runs to the entire elevation. The bay to the left is setback with the gablet to the window incorporating a blank armorial panel. The right bay is composed of one large gabled section with a blank date stone arranged above the window. The NE elevation of the original cottage is relatively plain, it is enlivened by a prominent stack and a piended canopy to the window. The SW side elevation of the original cottage is completely plain as it neither faces the road or river and was therefore not intended to be seen. The late 20th century single storey and attic extension run to the side and rear of the building. The interior is plain and has been re-configured to offer modern accommodation, the cottage is currently run as a bed and breakfast, 2004. Coursed rubble to principal and side NE elevations, random rubble to side SW. Yellow sandstone dressings to openings, quoins and base course. Timber boarded door with diamond paned small glazed upper panel, slim basket arched-shaped fanlight. Timber casement diamond paned windows. Decorative timber bargeboards to principal elevation incorporating spiked finials and drop pendants, plain bargeboard to side SW. Squat coped shouldered ashlar gable apex stack to SW, tall coped shouldered ashlar wallhead stack to side NE, cans to each. Overhanging pitched grey slate roofs with exposed rafters. Cast-iron rainwater goods to original cottage. The 1st edition map shows a small cottage set close to the road, this was probably cleared at the time Bridgend Cottage was built. The owner believes the cottage was built to house one of the gamekeepers who worked on the Moray Estate. 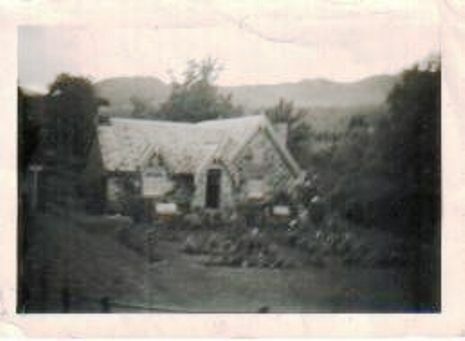 The cottage became disassociated from the Moray Estate and fell into the ownership of the estate of Sir James Wilson, the house then came into private ownership in the 1950s/60s.